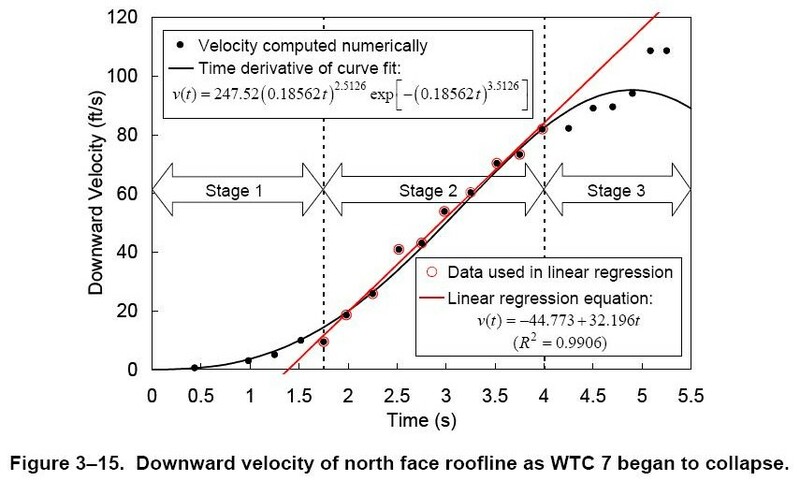 According NIST the constant acceleration of the roofline is 32.196 feet/s² or 9.814 m/s² between time 1.75 and 4 seconds when the roofline velocity increases from 11.57 to 84.01 feet/s or 3.52 to 25.61 m/s! This acceleration is equivalent to gravity acceleration = 100% free fall drop. The average speed during this time is 14.56 m/s and the total free fall displacement is 32.77 meters. This makes controlled demolition the OFFICIAL position of NIST. Anyone who does not understand this, simply does not understand what free fall drop means. Free fall drop means NOT DOING ANY WORK INCLUDING DESTROYING STRUCTURE BELOW AT ALL - OTHER THAN FALLING. It evidently means that 32.77 meters height of structure below must have been destroyed completely for the roofline to free fall drop. NIST has agreed there was freefall for 2.25 seconds. This implies 32.77 meters of the fall was without any obstruction from below. So therefore all column supports in at least eight floors must have been removed instantaneously, or at most within under 2.25 seconds. Thats 24 interior columns and 26 perimeter columns - 50 columns on 8 floors destroyed in under 2.25 seconds. Is this possible without additional explosive force, ie controlled demolition? NIST has agreed there was freefall for 2.25 seconds*. This implies 32 meters (105 feet)* of the fall was without any obstruction from below. So therefore all column supports on seven to eight floors must have been removed within 2.25 seconds. Is this possible without additional explosive force, ie controlled demolition? The interior columns had already started to collapse prior to to the FFA [free fall acceleration] so it was just the 58 exterior columns that had to have been removed on 7 to 8 floors, but that's still enough to prove CD. Chris Sarns on Wed, 09/01/2010 - 10:01pm.